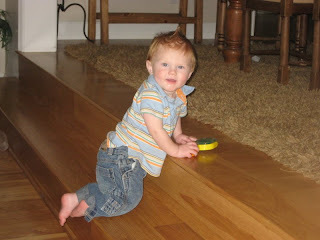 Last week Landon and I went up to Nana's house for the night. I had a late practice and so Great grama was going to watch him while he slept but that didn't go so well so Landon and great Grama came to practice with me. It worked out just fine because he LOVED sitting in the ball cart. 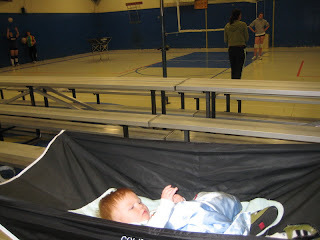 He watched practice in there while Grama pushed him around. Here are some pics. The next day we hung out and Landon had tones of room to play. Her house is 3700 square feet and ours is 1,000. 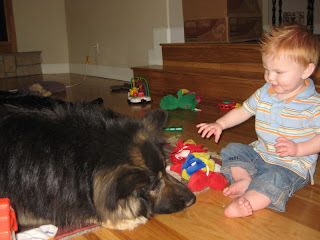 Landon Loves Toby, and discovered that he could crawl up stairs. How fun! 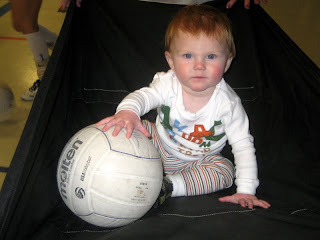 I love the pictures of him at volleyball practice. How is volleyball going? How do you like coaching??? How old is Landon now? I didn't know that you were coaching. I'm not a fan of coaching anymore. It is a LONG story! That is so cute of him in the ball cart. I just love it! He is one cute little stinker! Hey remember when we threw a whole bag of trash out the window of your car on our road trip to San Diego? That was so much fun! How fun your little man is! What are you doing these days? OK, that possum story is freakin SICK! Seriously, I read that post right before dinner...and your Trader Joes story is hilarious, sorry it was actually your life for a couple of weeks, bummer. Hey I will be around when you come up! I would LOVE LOVE LOVE to see you guys... I miss your face! i have a nephew who is Head Coach at East Carolina University, in Greenville, NC (a girls volleyball team).